Garlic Butter Pasta with Prosciutto and Peas is a simple dish that’s ready in less than 30 minutes. 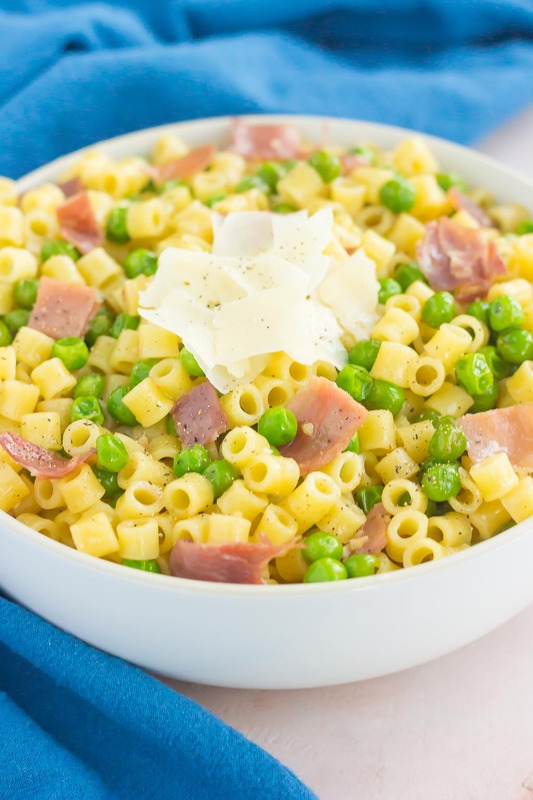 Filled with tender pasta, crispy prosciutto, peas, and a garlic butter sauce, this meal is packed simple ingredients and perfect for the whole family to enjoy! I’ve got a serious case of the Thursdays. As in I-want-to-crawl-back-to-bed-and-wake-up-with-all-the-coffee kinda Thursday. While I can’t fix the fact that it’s Thursday (although it’s almost Friday! ), I’m trying to look on the bright side today because…pasta! We need all the carbs today, am I right? Pasta is one of my favorite types of food. It’s just so versatile, so tasty, and just so good. You can jazz up, tone it down, and pretty much make it any way you like. It’s almost like pasta is a blank canvas, just ready for you to create your masterpiece. That’s pretty deep thinking for a Thursday, right? And today, I’m sharing one of my favorite shapes of pasta, ditalini. I love the small, tube shape of this noodle. It works perfectly in salads with greens, as it’s not overpowering with the texture or size. 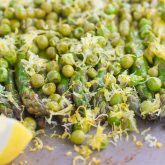 It also makes the best kind of addition to sides and main dishes. How perfect is this dish for 30 Minute Thursday? 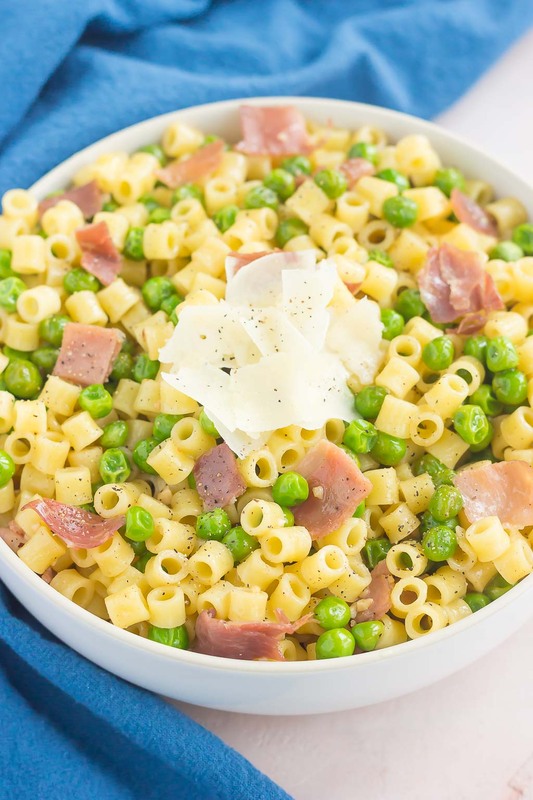 And you know me, I love prosciutto, and peas, too, which is why I thought it would be the perfect addition to the ditalini. 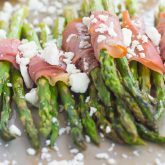 From this Arugula and Prosciutto Pizza to that Prosciutto Wrapped Asparagus, to those Bacon and Feta Peas and that Roasted Asparagus and Peas with Lemon, it’s easy to see that the two star ingredients pair well with most everything, especially pasta. 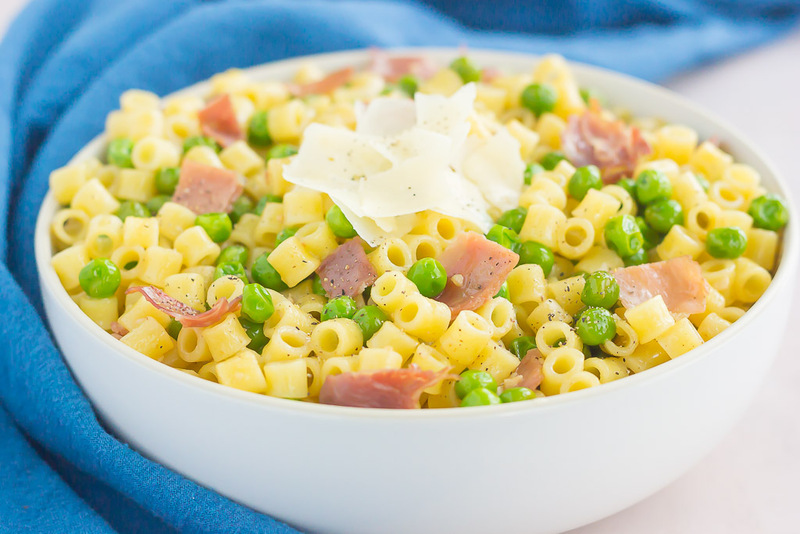 This Garlic Butter Pasta with Prosciutto and Peas is flavorful, yet simple. The garlic butter sauce gives this dish a hint of flavor, but isn’t overpowering. And because this pasta contains just seven ingredients, it can be whipped up in no time. In fact, you may already have most of the ingredients in your kitchen. It’s really that simple! And this pasta is so versatile, too. If you like more flavor, you can definitely increase the garlic, add in some fresh herbs, or even sauté some chicken or shrimp to pair with it. The possibilities are endless! So, beat those Thursday blues and whip up these simple, 30 minute Garlic Butter Pasta with Prosciutto and Peas. 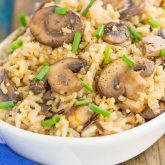 It’s fast, fresh, and perfect for an easy meal! Looking for more easy pasta dishes? I’ve got you covered! Garlic Butter Pasta with Prosciutto and Peas is a simple dish that's ready in less than 30 minutes. 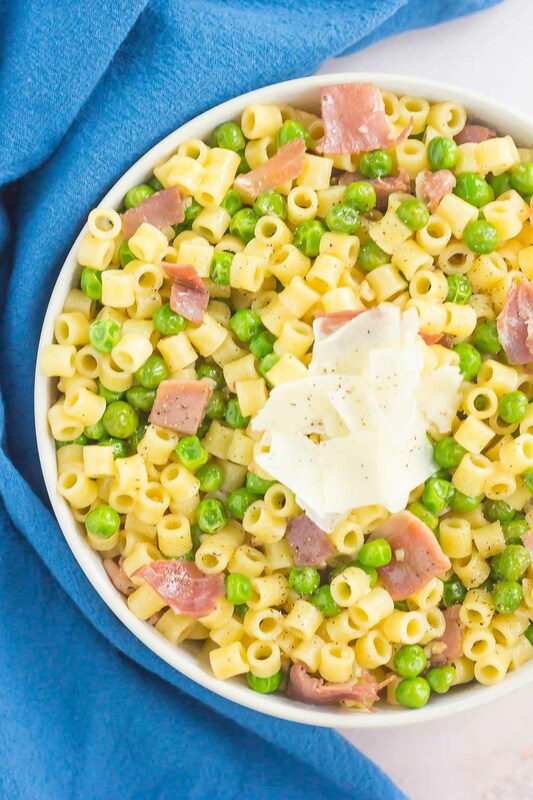 Filled with tender pasta, crispy prosciutto, peas, and a garlic butter sauce, this meal is packed simple ingredients and perfect for the whole family to enjoy! Cook pasta according to package directions until al dete. Drain and set aside. While pasta is cooking, in a large skillet, melt butter over medium heat. Add olive olive oil and minced garlic. Sauté garlic for 1-2 minutes. Add peas and prosciutto to skillet and sauté for 4-5 minutes, or until prosciutto begins to crisp and peas are cooked through. Remove from heat. Add pasta to skillet, along with shaved Parmesan cheese, salt, and pepper. Stir thoroughly, making sure everything is combined. Yay for lots of coffee and prosciutto in our pasta! Thanks for the sweet comment and pin, friend! Yesss, I'm right there with you, Gayle! Total case of the Thursdays!! Is it just me or does this week seem to be going on forever!? Totally calls for bowl after bowl of buttery pasta!!! This looks absolutely amazing, girlie! Wish I could face plant into this right now for breakfast! Pinned! Cheers! Prosciutto for the win! It goes with just about everything, doesn't it?! 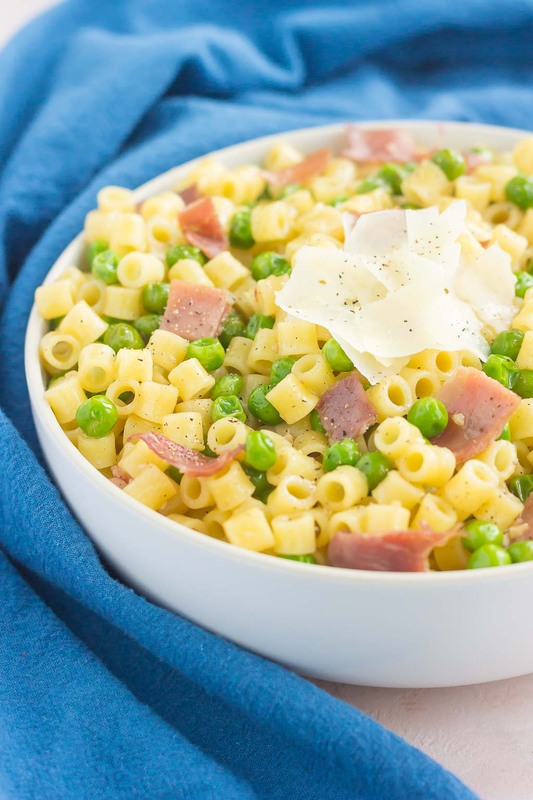 Pasta and peas is a staple quick and comforting dish in our house! I love this! Prosciutto is the best! Thanks, Annie! I take comfort in knowing that tomorrow's Friday! hehehe I love prosciutto and peas! and love this idea of putting them together with pasta! Have a nice weekend Gayle! Thanks for the sweet comment, Gaila! Happy weekend to you! haha what is it about thursdays??? I hear you! 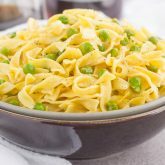 But this pasta would definitely pep up any day - I love that you used peas - I feel like they are so underrated! I agree, peas are definitely underrated! Thanks, Ashley! This would definitely be a popular dish in our house. My boys will devour anything that involves pasta, garlic and butter! :) And of course, I love the fact that it's FAST! Hope you have a great weekend, Gayle! Happy (almost) Friday to you! Isn't that the best combination! Thanks, Blair! This is definitely my kind of meal! So simple and looks amazing! Pinned!